What is your role in the new government? In the interest of the party, I will take up whatever role Rahul Gandhi considers good for me. Considering the aspiration of the workers, he will decide my role. We have faith in him. Did you anticpate that the Congress would forge an alliance with the JD(S)? I knew that if we fell short of numbers, a coalition was inevitable. However, Rahul Gandhi took the decision. What about giving the CM's post to the JD(S)? When we got less number of seats, we did not want a BJP government, but a secular government. We acted swiftly as we did not want the BJP to approach the JD(S). Your animosity with H.D. Kumaraswamy is no secret. What to do? I had to first convince myself and my followers. Individual choices have no place here. One has to think of the party and the country. The entire country wanted to see a secular government. We have to look at the party's aspirations, too. What is your big plan for the upcoming Lok Sabha polls? Deve Gowda has already spoken about this in our joint meeting. At an appropriate time, our party will take a stand on the issue. We have to work hard, taking our cadres into confidence. What transpired in the week after the election results? Every minute, the numbers were changing. We convinced our MLAs to come down to Bengaluru and stay together. We sensed that the BJP would try to approach our MLAs. The BJP men were calling them. Even unauthorised people like Janardhana Reddy were calling. Suddenly, he became the voice of Amit Shah. Then, one day, he was speaking to an MLA. I took the phone and asked Reddy to first put his own house in order. Jokingly, I asked him whether the BJP would make me deputy CM if I brought 10 MLAs with me. Is it true the missing MLAs were with Reddy? Yes. Reddy was calling and harassing all our MLAs. He was thrown out of the the BJP. But, he assigned his son and brother to pick an MLA each and keep them. He was pretending to be God. How did you manage to keep the MLAs together? Human relations is important. As Mahatma Gandhi says, if you want to control yourself, use your brain, and if you want to control others, use your heart. 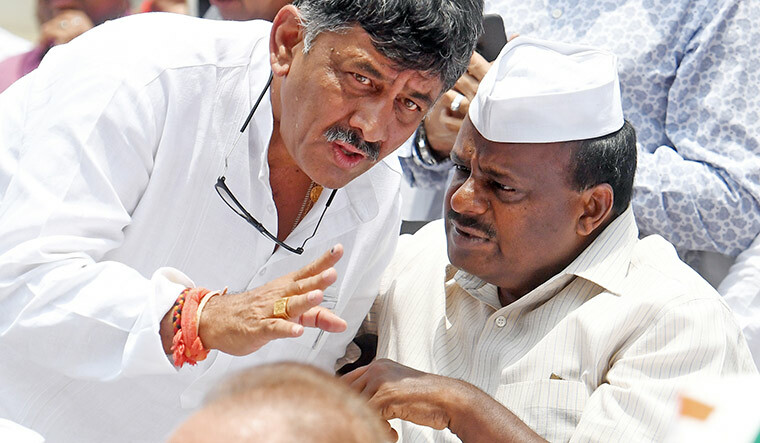 Will your alliance have a common candidate for elections to the two seats—RR Nagar and Jayanagar? No. We are in the process of discussions. In RR Nagar, we have told the leaders clearly that we must win. Do you think the BJP will still be a threat to the coalition government? The BJP is a political party. It will do its duty. Amit Shah, who maintains he is not involved in all these, says the BJP can form the government, if the Congress frees the MLAs. They will go to any level to come to power. Who will have the final say on the allocation of portfolios? A coordination committee will look into all these aspects. It is too premature to discuss these issues.